Do you know that the modern accordeon has got a precursor? 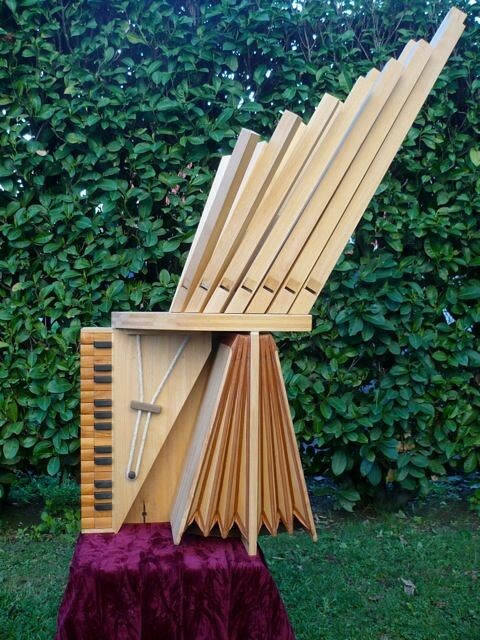 Can you imagine a continuo wind organetto? This is exactly what Leonardo da Vinci projected in XVI century! This is exactly what Walter Chinaglia&Guillermo Perez reconstructed and play today! 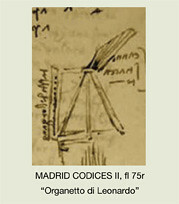 The Madrid Codices I-II are two manuscripts by Leonardo da Vinci which were discovered in Madrid in 1964. Topics discussed include mechanics statics, geometry and construction of fortifications; they are among the major engineering treatises of their time. As often, Leonardo introduced some techinical novelties to previous machines and to musical instruments. In the Folio 75r, he sketched an organetto which probably could be considered revolutionary respect to the medieval organetti. To our knowledge, for the first time, he projected a «double action bellows» to garantee the so called «ventum continuum»; he introduced an upright keyboard (in this, we easy recognize the modern accordeon); he wrote «canne di legno о di carta» (paper о woodden pipes), as typical in Renaissance small camera or chapel organs. The authors of this work Walter Chinaglia and Guillermo Pérez gave a detailed interpretaion of the Leonardo’s sketch. This takes in account all the elements mentioned above; morever a plausible justification of the strange pipes disposition was found. This suggested an uncommon solution which help to fit many pipes in small space. Finally, after an accurated voicing for a reach «principale» sound, organetto di Leonardo can be played to discover a new musical world: the XVI с. music!